Why are there holes or sunken lesions on my potatoes? Well, there are a few possible explanations, depending on the circumstances. Are the holes on the surface of the tubers or in the center? Are they wide or narrow? Either insects or environmental factors are the likely causes. White grub damage on sweet potato (L) and a white potato cultivar (R). If there are shallow or deep holes on the surface of the potato that are not associated with decay, it may be the result of feeding by white grubs. White grubs are the larvae of several different beetles and are most widely known for the damage they do to turfgrass by feeding on the roots. Damage to vegetable crops and herbaceous ornamentals most often occurs in new gardens that were previously grassy areas, or gardens that have grassy weeds. Sufficient control is usually obtained by managing grassy weeds, or by rotating crops with legumes (beans, peas). Tilling the soil may reduce populations by killing the larvae either by physical injury or by exposing them to predators and the elements. This is best done from May through June for older larvae and from late July through September for the younger larvae. Avoid injuring the roots and developing tubers of the plants! White grubs were identified as the cause of these holes on potato and sunken, chewed out lesions on sweet potato. White grubs may also cause damage to other root crops including beet, carrot, turnip, and rutabaga. They will feed on the roots of other vegetables and ornamental annuals and perennials. Strawberry roots are also attractive to white grubs. White grub damage on vegetables is discussed in more detail in this fact sheet. Another insect pest that will chew holes in root crops such as potato and carrot is the wireworm. Wireworms are the larval stage of click beetles, so named because of the ‘clicking’ sound they make when they right themselves after accidentally winding up on their backs. These pests have life cycles that vary from 2-6 years depending on the species, so multiple stages of the insect can be present at any given time. Like white grubs, wireworms are often more of a problem in areas that were previously grassy or in fields or gardens with grassy weeds. Many of the adult click beetles prefer to lay eggs near the roots of grasses so they are often associated with weedy fields. When wireworms attack root crops at an early stage, deformity may result. If feeding occurs later on more developed tubers (or carrots, etc), damage will be in the form of holes or tunnels. You can check for wireworms by digging holes the size of a softball and filling them with chunks of carrot or potato, covering, and checking in 4-5 days to see if they have been attracted to the bait. Complete control of this pest where it is established is very difficult. When numbers are high, insecticides are used. Another option for partial control is the use of biocontrol agents such as beneficial nematodes. Check out this fact sheet for more on wireworms. Cavities in the center of potato tubers that appear healthy on the outside are caused by a condition known as ‘hollow heart’. The cavities are irregular or angular in shape and have brown edges. This is associated with rapidly growing tubers. 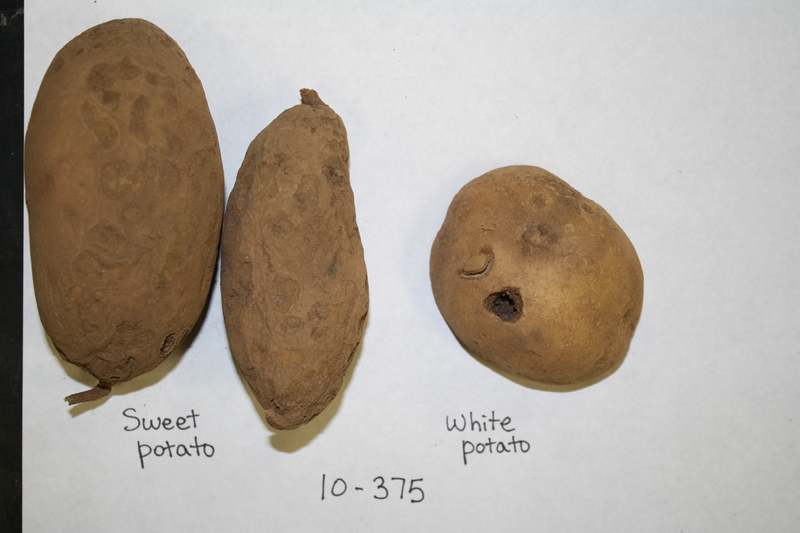 This is most severe when conditions favor rapid tuber development, especially following drought stress. Hot dry weather followed by cooler weather with rain may result in these cavities. Practices that inhibit rapid spurts of tuber growth will reduce the incidence of hollow heart. This can also be worse where there is a marginal potassium (K) deficiency in the soil. Hollow heart of potato can be reduced in several ways. Some cultivars are more prone to this condition, so trying other cultivars is one option. Use closer plant spacing to increase competition between plants which will reduce the likelihood of rapid growth spurts in the potatoes. Hill the potatoes. Maintain uniform and consistent moisture levels in the soil using irrigation during dry periods if possible. Have the soil tested and add potassium and other nutrients as recommended. Click here for more info on hollow heart. Thank you so much for answering my question on potatoe hollow centers. Do you have info on potato plant pests that eat the green leaves & leave small & larger sized holes? Colorado Potato Beetle will eat holes in the leaves. So will the night feeding Asiatic Garden Beetle. Slugs will also attack potato leaves. See the fact sheet links below for information on these insects. Is it OK to eat potatoes that have been nibbled by wireworms? I am wondering if it’s OK to just cut off the damage part of the tuber and eat the rest? The tunnels don’t go all the way in, and there seems to be plenty of edible tuber left. I don’t know if the whole tuber is infected in some way or if the chemistry has changed in response to the invasive visitor? It is safe to eat the remaining potato after you cut out the damaged part nibbled by the wireworms. Chemistry will not be changed by their feeding. While I’m here, may I ask a question about storage? If you’d prefer I post this question in another thread on the website, will you please let me know? I don’t have a root cellar or time to build an earth box for storage, as I will be busy and indisposed for the next 12 days. Bad timing on my part, perhaps, to have just dug up the potatoes and clipped the orange pumpkins. I was trying to save them all from further damage from pests. The coldest part of my home is a basement – NOT earth, and not particularly humid – but perhaps better than the closet, which is my other “root cellar.” At this time, given the early harvest time, they are both around 68-72 degrees. 1) How long should I let the tubers dry out before storing them in more ideal conditions? 2) For how long can they stay in a dark room at 68-72 degrees and be ok? 3) For how long might the above conditions be ok for the pumpkins, too? I ask because some of my pumpkins that I clipped and left outside on the porch (they had some worm holes) started getting weepy and mushy within several days. I have read that pumpkins can stand to be cured for about 10 days, so I’m hoping they can skate by for a little while. 4) After the drying or curing period, would it be ok to store the tubers and the squash in the refrigerator? I have read about how that can affect potatoes, but I don’t care about the discoloration that might happen if I were to fry them. Do not store any potato with wireworms or damage as the potato will rot. Use the damaged potatoes as soon as possible after cutting out the bad areas. I planted my potatoes from starts the second week of June. I started getting potatoes up to 5 ounces about two weeks ago. I just took out one potato that had a hollow center. It weighed in at 13 ounces. Having grown up on a row crop farm where we grew a large acreage of potatoes, I am thinking this growth is WAY to fast. I am going to try to “mine” for all the larger potatoes and keep the smaller ones going. I have a plot of about 8 feet my 6 feet and because of the way I planted them, I expect to get close to 100 pounds. I have already harvested 5 pounds. Hollow centers of potatoes are a physiological disorder caused by stress on the potato plant. The stressor can be uneven moisture in the soil or high or even low temperatures. You are correct is finding that it happens more often in the larger potatoes and hopefully your smaller tubers will not be affected. We have had several heat waves and dry periods followed by heavy rainfall flooding the soil. These extremes will cause hollow centers. I am working on pest insect information sheets for South Dakota Master Gardeners to use. I would like permission to use your excellent photo of the potatoes with white grub damage . This would be an Extension publication and used only for educational purposes and not for profit. Thank you for your help. Joan Allen took the photo and should be contacting you soon if she hasn’t already. Thanks for reading!